Investment in infrastructure is important to generating long-term productivity gains. 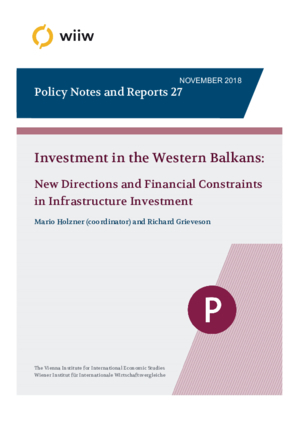 The Western Balkans lack infrastructure capacity and investment – particularly in non-traditional sectors such as water, sewerage, waste, health, social affairs and education. Two important regional infrastructure investment initiatives are active in the Western Balkans: the European Western Balkans Investment Framework WBIF and the Chinese Belt and Road Initiative BRI. Both are focusing on traditional infrastructure such as energy and transport and both come with a volume of about EUR 8 billion in loans. The European initiative has in addition provided for some EUR 800 million in grants and has an emphasis on Green Economy projects. Overall infrastructure investment needs in the region are huge. Lower bound estimates of additional investment needs only in alternative infrastructure investment for the next five years are at around EUR 800 million. The financial conditions in the region are underdeveloped but improving. Nevertheless, external debt levels have increased substantially since the outbreak of the global financial crisis and thus pose a serious threat to economic stability in a situation when the global interest rates are again on the rise. Thus, substantially hiking up investment in traditional as well as non-traditional infrastructure in the Western Balkans without dramatically increasing the countries’ indebtedness is the primary duty in order to achieve higher long-run productivity growth and provide the population a perspective for a better future without a need to migrate. Short-run pragmatic policy recommendations include: Western Balkan governments should rebalance their infrastructure investment mix to support the Green Economy; the new EU IPA III funds should be rearranged to focus more on Western Balkan alternative infrastructure sectors; in order to create the necessary financial leeway for more public investment in non-traditional infrastructure, national governments in the Western Balkans could adopt the Austrian ASFINAG model; similarly, PPP projects might be considered but these need particularly good management; the IFIs should issue GDP-linked loans for crucial investment in the region in order to avoid macro-financial crises in the future. Long-run forward-thinking policy recommendations include: a Joint Project Pipeline of a Common Western Balkans Investment Committee with supranational overruling powers representing the infrastructure interests of the whole region; the creation of a Western Balkans Regional Infrastructure Fund with a much bigger volume and much stronger grant component than the current Western Balkans Investment Framework in order to curb the influence of external players in the region and reduce indebtedness; joining the euro area – even if only with limited rights, e.g. without voting rights – before EU accession would be a powerful tool to bring down interest rates and improve the financial conditions for both the private as well as the public sector’s investment. Acknowledging that often political tensions are a barrier to greater connectivity and trade between countries, support for infrastructure investment could be used as a bargaining chip in EU-brokered negotiations to solve long-standing political stalemates in the Western Balkans.